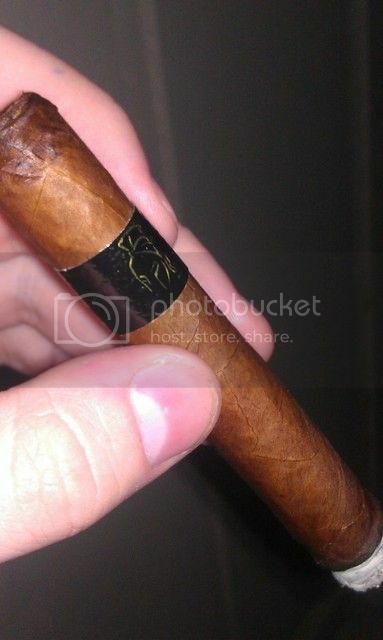 The Man O' War Puro Authentico is a mareva made by A.J. Fernandez in Nicaragua, using all Nicaraguan filler, and a Habano wrapper, grown in Esteli, was originally conceived as Abdel's personal, day to day smoke. It features a neat little pig tail cap, and a closed foot (wrapper extends beyond, and folds over the foot). This Particular example features a slightly reddish, chocolate brown wrapper, with almost no visible veins, and tight seams. The cap seems expertly applied as well. The band is a simple glossy black, with a simple gold helmet (the same style used on the other Man O' war bands). The aroma from the foot is spicy, with a mix of woody notes, and barnyard type smells. The cold draw reveals a strong sweet cocoa flavor, a touch bitter, with a fair amount of spice. In fact, the wrapper itself gives off some heat on the lips and tongue. The draw itself offers a touch of resistance, just right. The first few puffs bring not a lot of complexity, but certainly big, bold flavor. There is a woody, very slightly sweet core, a touch dirty, with a long, very spicy, hot, black pepper finish. This is one tough, cute little cookie. The draw is perfect, and smoke production is outstanding. The mouth feel is oily and thick, befitting a strong, full bodied Nicaraguan powerhouse, even if it is in a small package. In fact, I might go so far as to say this is the spiciest cigar I have had in quite some time. One must be careful retrohaling nasally with this one, as just a very small amount of smoke brings a substantial scorching heat. The ash holds for the first segment for just shy of an inch, falling in a solid chunk into the tray. The flavor profile doesn't change a whole lot in the first few inches, with the only variant being the coming and going of sweetness and bitterness. The bitterness is not acrid, rather more of a coffee bitterness, though I can't say there is much coffee flavor. The spicy finish remains impressively potent, not something that often happens. Most spicy cigars mellow out after the first inch or so, but the Puro Authentico keeps the heat cranked up. The body is equally heavy, as is the strength. By the two inch mark, I am feeling it in my gut a bit. Ash holds for the second time for closer to an inch and a half. Through this period, noticeably, things get a bit earthier, and darker. I cannot honestly say that this is an overly complex cigar so far, but the boldness, strength, flavor, and body all are making for an interesting, if rustic, and maybe a little rough around the edge... combination. Construction and performance as relates to it have been virtually perfect. The burn line is straight, the ash tight, the draw perfect, and smoke production bountiful. The flavor profile reminds me quite a bit actually of a recently popular sort of chocolate bar, one that combines 72% dark chocolate and hot chili pepper. An odd combination that actually works very well, and I would say is well represented here. There is almost no change from that point to the end, though that can hardly be called a bad thing, as pleasant as the combination of flavors, sweet cocoa and wood, with an earthy core feel and taste, and a long, slow hot pepper finish, has been. The burn line, draw, and smoke all remain wonderful through the final inch or so, when heat and squishiness forced me to end this cigar. The strength remains a constant factor through almost the entire cigar, and it is quite full in strength, so not a cigar for those who do not care for a little kick from the nicotine factor. Of note is that weather present while I smoked this stick. A recent review on one of the more popular review sites mentioned humidity as a major potential factor in tar and color bleed from this stick... Well, it was raining off and on (100% humidity...) as I smoked, and the temperature was in the high 80s fahrenheit, and I suffered no such problems, nor have I ever had any such issues with the handful of these cigars I have previously smoked, and enjoyed. I think this may be an example of the necessity of smoking several samples for a review, as a dud is not unheard of in cigar production. Ended at 11:42pm, for a total smoke time of one hour, 12 minutes, which for a petit corona is a fantastic burn time. This is not a cigar for the lover of mild cigars. It is however a fantastic, rustic, earthy, spicy powerhouse, suited well to those who like strong cigars, but not the recent trend towards behemoth vitolas. The price, and presentation also both make the MOW Puro Authentico a cigar quickly working its way into my "regular" rotation, as they are in no short supply, are readily available at a couple of the big online houses, and come conveniently packaged in inexpensive boxes of 10 (great looking boxes too, I might add). For me, and this is where personal opinion comes into these reviews, these cigars represent a great way to enjoy a strong, rustic, straight forward smoke, suited to reading a book, or watching a film while enjoying good flavor that doesn't necessarily require one's full attention to appreciate a plethora of transition. Great smoke. I've only had one that had some tar, that one I had no cutter or punch so I bit the tail off. I got tar about 1/2 way through and corrected it with a utility knife with a sharp blade. Draw opened up and no further problems were there. I love these. I had a bad stick the 1st time I smoked one of these. After seeing so BOTL on here that have the same tastes as me rave on this stick I got a box. Just had the first one form the box ROTT last night. Great smoke, love the size, love the flavours and I see more boxes in the future. I really like all your reviews, doc. I think you described the Puro perfectly. I had one about 2 weeks ago with Marker and it was very good...just enough spice to keep you interested and not overwhelmed. These will be my go-to when I need a quick one or a smaller full smoke after a few drinks. I had no cutter or punch so I bit the tail off. Just got 3 from Granneja can't wait to try them after they rest up from the truck ride. Ricky, I wasn't that far of a truck ride so seriously feel free to light one up NOW!!!! If you don't enjoy the hell out of it, I'll send you at least 2 to make up for the one you burned. That's pretty much the same reaction I had when I tried my first: "Huh. Firecracker definitely fits." just got a box of them, love these sticks. I had one from the original release last week. It was awesome. The initial pepper blast was subdued and so meaty. +1. I would gladly leave my wife for this cigar. Quickly becoming the go-to. Just got my box of puros in today. Did anyone else notice the sticker on the bottom of the box with a date on it? Mine said 11/4/20. I'm figuring that's when they were boxed. Anyone know for sure?? Love this stick - great burn, smoke output, flavor, etc - just an all around amazing stick. Only thing that bothers me is the price - $60 for a box of only 10 is high IMO, especially when you can nab a box of 20 Diesels for $60. My order of two boxes arrived today. I have just finished my second one and calling it a firecracker is spot on. I see several more boxes in the future for me. I noticed the sticker on the bottom of the box did not pay attention to it. I'll check it in the morning. Agreed! Just a side note... the one I have with numbers on it came from my deal from Tim the Beard. You think that maybe it was simply for packaging reason in the warehouse? dang good review. Thanks for the informative twist on it. One of my favs. If you find the answer to what a JAM is xmacro, let me know.